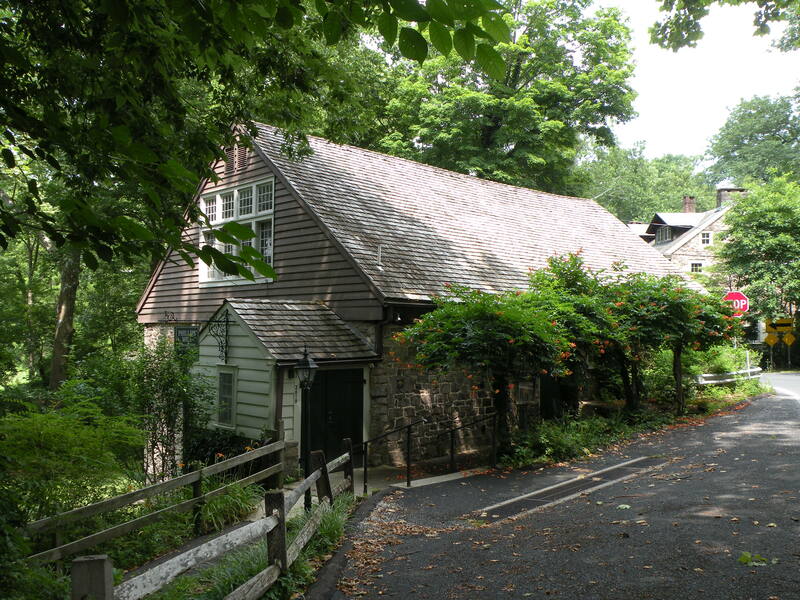 The Phillips Mill Historic District is one of the gems of Solebury Township. The District is composed of the English Village, the Mill, the Hotel du Village, Lenteboden, and St. Phillip’s Chapel. The charming little English Village is quite hidden from view from the road. Stone walls and decorative gates enclose what is surely the most unique enclave in Solebury Township. The English Village contains eight historic buildings; all but one are private residences. The most familiar building in the English Village is the Inn at Phillips Mill, long one of our area’s finest restaurants. This charming eatery was built as a barn in 1750 for the Aaron Phillips’ farm. The English Village is adorned with decorative ironwork and unique architectural features—all the work of Morgan Colt (from the family of Colt-45 fame). Colt was an architect, painter and craftsman who settled at Phillips Mill in 1905. His artistry can be seen throughout the rest of the Historic District including Lenteboden, Hotel du Village and St. Phillip’s Chapel. Across River Road from the Inn is the gristmill built by Aaron Phillips in 1756 to grind wheat into flour. It is said he supplied flour for Washington’s troops in 1776. The exterior of the Mill today is virtually unchanged, but the interior now provid es a community venue for the arts and is owned by the non-profit Phillips’ Mill Community Association. The first art exhibition held there was organized by artist William Lathrop. Lathrop purchased the mill and the miller’s house across the road in 1900. Around the same time, fellow artists Edward Redfield and Daniel Garber lived nearby, and together these three artists founded the New Hope Art Colony. The buildings that are now occupied by the Hotel du Village Restaurant and Lodge once housed the Holmquist School for Girls, founded in 1917 by Karline Holmquist, a friend of William Lathrop. The school was known as a pioneer in progressive education; its most distinguished alumni is anthropologist Margaret Mead. St. Phillip’s Chapel was originally built as a one-room schoolhouse in the early 1800s. The building now serves as an Episcopal church. Like most of Bucks County, the area around Phillips Mill Village has seen dramatic change. But this charming and unique village has survived. Excerpted from Phillips Mill, Cradle for the Arts in Bucks County, by Willis M. Rivinus, 2004. 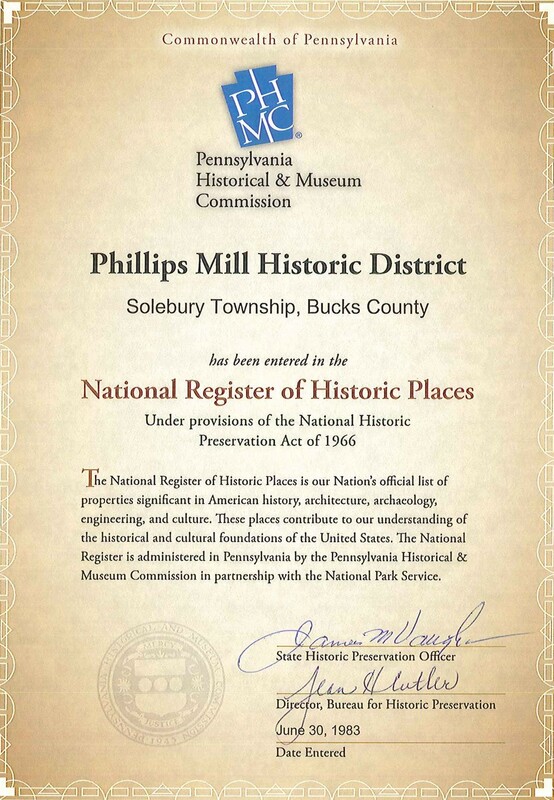 Read more about Phillips Mill on the Solebury Township site. 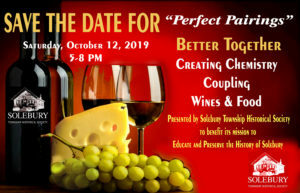 Read more about the Phillips’ Mill Community Association and its programs.